Andy Greenwood is a freelance trumpet player. He was fortunate to study with the great Bobby Shew whilst a member of the Wigan Youth Jazz Orchestra. 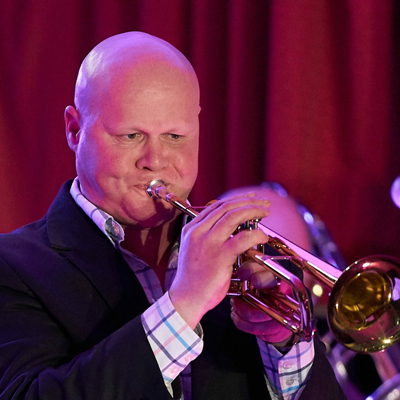 After spending 2 years working for Royal Caribbean Cruise Lines Andy joined the National Youth Jazz Orchestra, during this time was asked to join the Syd Lawrence Orchestra, where he remained a member for 6 years. Throughout his musical career he has worked with artists such as Al Jarreau, Chuck Findley, Wayne Bergeron, Bobby Shew, Jon Faddis, James Morrison, Steve Gadd, Bob Brookmeyer, Michael Gibbs, Bill Frisell, Eliane Elias, New York Voices, Conte Candoli, Buddy Childers, Chaka Khan, Gladys Knight, Maceo Parker, Westlife, Michael Buble, Shirley Bassey, Georgie Fame, Barry Manilow, Kylie Minogue, Jamie Cullum, George Michael, Robbie Williams, Jamiroquai and The Who. He has performed with many groups including The Metropole Orchestra, Frankfurt Radio Big Band, Super C Big Band, Laurence Cottle Big Band, Steve Sidwell Big Band, Guy Barker Big Band, BBC Big Band, Syd Lawrence Orchestra and the Ronnie Scotts Jazz Orchestra. West End shows include Wicked, Chicago, My One and Only, The Rat Pack, Saturday Night Fever, Guys and Dolls, Ray Charles, The Producers, Sinatra, 42nd St and Motown The Musical.